A feature of the New York dining scene in the mid-1900s was gourmet clubs. The Wine And Food Society, Inc. was a well-organized and influential such body. Members included senior business figures and arts and culinary celebrities. The Society still exists as part of the world-wide The International Wine and Food Society. A less visible group operated for at least 20 years from about 1933, The Gourmet Society of New York. Some of its menus from the 1930s and early 40s survive in the New York Public Library’s menu archive, and elsewhere. They are fascinating curios, typed and mimeographed in contrast to the more polished productions of the Wine and Food Society. What they lacked in presentation they more than make up for in the passion and ethnological investigation reflected. The dinners prove once more that interest in local, regional, and ethnic cuisines is not new. It was being cultivated by small groups of food and wine lovers in Manhattan, London and other places where gastronomes with a questing, often intellectual spirit gathered. A dinner club of gourmets and cosmopolites. Six or seven dinners per season at different selected dining places. Membership open to all who have palates aesthetically sensitive to good food and drink, and who have imagination enough to cherish the gourmet tradition. The driving force was J. George Frederick, an executive who ran a business statistics and research consultancy. His wife Christine assisted and is remembered for her work as a home economist and theorist of the consumer society. Representative dinners presented the cuisines of the East Shore, Maryland; Canton, China; the classic Paris kitchen; and New England. The wines listed in the menus that survive were mainly American** yet this was the 1930s-early 40s: the dark age of American wine appreciation. Usually the producer was listed: Inglenook, Cresta Blanca, Beaulieu, or another of the few wineries then making a wine deemed worthy to serve epicures. A dinner given in January, 1939 showcased New Orleans’ gastronomic heritage. Note the compact description of the meal’s object under the engaging term, “General Idea”; the menu as archived by the NYPL may be viewed here. At the dinner the Midwestern poet, essayist, and biographer Edgar Lee Masters spoke. Also on the dais were folklorist and regional historian Carl Carmer, Thyra Winslow, and W. Irving Moss. Moss was an insurance executive from New Orleans. Winslow was a literary celebrity originally from Arkansas, one of those unlikely combinations (Jewish birth, distant regional upbringing, and “cosmopolite”) for which America was noted. The menus often contained cultural notes on the dishes or related cultural traditions, which adds to their value. Typically, recipes were included as well. Frederick had spent time in New Orleans absorbing variations of Oysters Rockefeller, and decided on his own version for the 1939 gathering. The bivalve type was noted, Robbin’s Island Box oysters. Robbin’s Island in Peconic Bay, L.I. is still noted for oysters. They’re on the menu occasionally at the Oyster Bar in Grand Central Terminal, NYC. After some 90 dinners by the mid-1950s the group was engaging in bold exercises such as an all-New Jersey dinner. A press account was published of the latter. 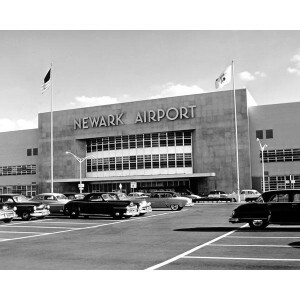 The writer was appropriately mordant in tone – this was Eisenhower’s America – including by remarking on the unusual locale, the Newark Airport restaurant. Details of the meal were explained in bemused tone as e.g., the “blonde wine” served. [Quick-talking host, we’ll call him Anthony]: “So George, who would have thought next-door Jersey was an interesting place for food, how did you come up with that?”. George: “Well Anthony, there is an old Dutch community here you know, in fact the ‘Jersey Dutch’ language only died out earlier this century. They’ve got some interesting dishes and there’s also some food from around Bergen and Passaic that is a fusion of old European and native cuisines. Our Ramapo trout tonight might be from that type of eating. The staff in the restaurant are mostly Jersey and they still have these dishes in their family”. Anthony: “Now that’s fascinating. [Goes into kitchen trailing cameras and tastes soup from a tall metal pot]. “And that’s amazing, all Jersey ingredients you say? We don’t need to go to the Texas border or Baghdad to find the exotic and tasty, it’s right in our own backyard, huh?”. George: “You said it. Try this Renault American Champagne, it’s wonderful!”. Anthony: “Sure thing. I’ve got to finish this amazing Laird apple brandy first. I thought only France made that”. At the accacia-scented New Orleans dinner orange wine was served as well as an unattributed “Chablis” from California. The former perhaps was carried to Manhattan by Irving Moss. Orange wine was a notable product of south Louisiana where navel oranges were grown, and they still are, despite Katrina. The Federal Writers Project took note of the winy specialty around the same time. The recipe is very old and probably arrived in the south via the Caribbean. It is ultimately from England, home, native or adopted, of most of the world’s great drinks. Of the Chablis, one guesses it was an early version of Napa or Sonoma Chardonnay. Can you still get orange wine in Buras-Triumph, LA as the orange cultivation area is now called? I don’t know, I’d imagine some families still make it for their own consumption. I wasn’t able to find a commercial example. Old manuals give recipes though for anyone interested. This modern recipe book offers a shrimp boiled in orange wine, which suggests that down Louisiana way, the true wine of the country has not been abandoned. *Note re images above: both images are believed in the public domain. The first image, the menu from 1939, is from the New York Public Library’s menu archive as linked in the text. The other is item no. 31185 from the aviation archive of the Port Authority of New York and New Jersey, here. **Foreign wines were sometimes served at Gourmet Society events but for American regional menus domestic wines or non-wine drinks were usually served. Can the Gourmet Society’s 1939 and 1954 Dinners be Recreated?